The new Aluminum Skidplate fits the 08-up KLR. Protects the water pump and stator very well. Comes with all mounting hardware. Works with our TPI Adjustable Center Stand #CY1223. WILL NOT work with SW guards. 07-earlier skid plate if you plan to install SW Bars. You can install the Skid Plate now and purchase the SW Bars at a later date because the Heavy-Duty Skid Plate can easily be installed on the 08-up models. 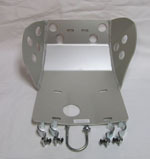 It does not require mounting to the front motor mount.